Icurrio - 21centuryed Tech: Digital Teacher... Welcome To The Future! From the right content to the right engagement. All in one place. As educators continue to shift from “traditional” classrooms and printed textbooks to a blended learning environment, using free open educational resources (OER) presents exciting opportunities to personalize learning and reduce instructional materials costs. Of course vetting thousands of digital resources, organizing them, incorporating them into instruction and delivering them to students can be time-consuming and challenging. It is for this reason that Icurio is now part of an ongoing digital resource toolbox for teacher. You will soon discover that Icurrio is far from a traditional learning object repository. The amazing Resource Library delivers a dynamic collection of over 330,000 vetted, contextualized, standards-aligned digital learning resources from a broad range of content providers that can be delivered through My Big Campus, or any future educational technology system, platform or device that a district employs. The power of Icurrio is its leveraging of an amazing Resource Personalization Services Platform. You will find that each resource in the Library has cleared a rigorous 127-point certification process and is expertly tagged according to resource type, language, authority and subject depth, alignment to relevant standards, grade level, readability score and up to 57 defining characteristics. Watch the below video and then read even more about the wonderful resource Icurrio can be for both you and your students. Learning Facilitator and Curriculum Builder: Icurio empowers educators to create a dynamic digital curriculum that supports the print-to-digital transition, delivers on the intent of standards, and enables personalized learning. Best of all, the lesson builder allows for access by students on their time providing necessary formative assessment that can be collected along the way. 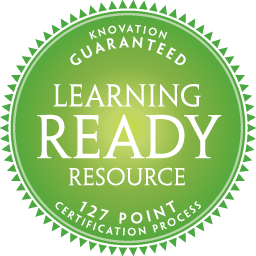 *To learn about Knovation’s 127-point Resource Certification Process, please read CELT’s professional review. Download Whitepaper.